The legendary Amalfi Coast stretches along the south side of the Sorrentine Peninsula, which juts out into the Tyrrenian Sea and separates the Gulf of Naples from the Gulf of Salerno. It is famous for romantic dwellings that cling to mountains above a deep blue sea. The narrow coastal road, with countless tunnels and bridges, winds from village to village, each one more photogenic than the last. The "Blue Ribbon" was built by King Ferdinand II in 1853, and before that time the coast was only accessible by sea. I boarded a little blue bus in Salerno and headed up the winding road to Amalfi, and changed buses there for Positano. The Positano bus arrives twice a day from Amalfi during off-season, dropping tourists outside the Bar Internazionale miles above the town. I was hauling heavy bags, including a marble statue bought the day before in Paestum, so I cancelled my seaside reservation, and moved into a hostel on the main road. My room came with a comfortable cot, some flowers in a vase, and a tiled lanai with a view of Capri. The rent included pasta and wine across the road, with other solo travelers like me. The terraced houses led down to the sea, painted white, yellow, pink, peach and terracotta. Three little coves lined the coast, divided by steep cliffs with medieval guard towers. The next morning I walked down through narrow alleyways and gardens to the Chiesa di Santa Maria Assunta, a 13th Century church with a majolica tiled dome. "Positano bites deep," wrote John Steinbeck in 1953, "it is a dream place that isn't quite real when you are there and becomes beckoningly real after you have gone." Most of the hotels and restaurants were closed during off-season, but it was nice having the town to myself. I spent two days wandering up and down the hills exploring one of the most beautiful villages on the coast of Italy. 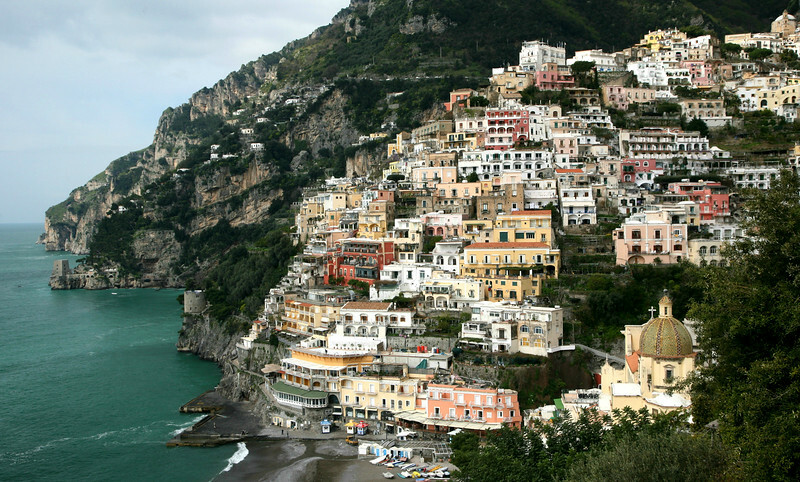 Positano is named after Poseidon, Greek god of the sea.